TOP EFFORT: Warren Schmidt (left) and Phil Heissenbuttel (right) with Townsville’s BMW Scott Mcelligott. TOWNSVILLE BMW regional qualifiers excelled at the 2017 BMW Golf Cup final held at Millbrook Resort in Arrowtown, New Zealand last month. 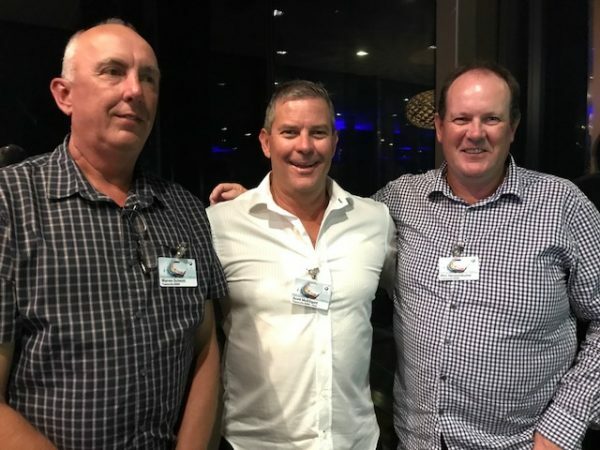 Willows Golf Club member Warren Schmitt won the A grade division on a countback from Phil Heissenbuttel (Townsville Golf Club) after both returned 39 points. Warren’s victory was more rewarding due to the travelling difficulties some of the Queenslanders experienced when their aircraft was unable to land in Queenstown due to strong winds, which meant a diversion to Christchurch. That resulted in a seven-hour bus trip. The party only arrived at their destination at 2.30 in the morning, leaving them sleep-deprived for a 9am tee time. Still, it made Warren’s victory even sweeter. Warren will now represent BMW Australia at the International final to be held at Fancourt Golf Resort in South Africa this month. It’s the second time Phil has finished runner-up in the Australian final. Maybe it’ll be third time lucky, Phil? Meanwhile, women’s qualifier Jean Krogh from Townsville Golf Club finished down the leaderboard. Still, she didn’t make any excuses and thoroughly enjoyed herself. Fellow Queenslander Rod Smith (Maroochy River Golf Club) won the men’s nearest the pin on the seventh hole of the Coronet Course. Townsville’s Rowes Bay Golf Club hosted the 2017 Townsville BMW Golf Cup qualifying round last August.